CINCINNATI — Years before it opened, the I-71 interchange at Martin Luther King Boulevard was intended to be a gateway to innovation and technology. Today, plans for development near that intersection could reach more than $1 billion in investments. "We began visiting and researching innovation districts probably four years ago," said Beth Robinson, president and CEO of the Uptown Consortium Inc. The consortium is a nonprofit community development corporation focused on planning and leading development projects in Cincinnati's Uptown neighborhoods, including Avondale, CUF, Corryville and parts of Mount Auburn. The neighborhoods are about a mile north of downtown Cincinnati. "We took that opportunity to study what should happen there at that interchange," Robinson said. "Because it was really a once-in-a-lifetime opportunity to remake our entryway into Uptown." Robinson said the Uptown Consortium saw the opportunity to tap into the emerging technological demands occurring in industries around the world. They decided to create an innovation corridor at the I-71 and MLK interchange. The idea is to create a district where medicine, research and technology come together to build future innovation. "We see the Uptown Innovation Corridor as the region's opportunity to capitalize on the opportunities that present themselves with this new economy," said Robinson. The Uptown Consortium is made up of organizations such as the University of Cincinnati, Cincinnati Zoo & Botanical Garden, Cincinnati Children's Hospital Medical Center, UC Health and TriHealth Inc.
Several of the organizations are expanding into the Innovation Corridor. UC's 1819 Innovation Hub opened last fall on Reading Road, about a block away from the MLK intersection. UC's Gardner Neuroscience Institute on the nearby campus of UC Health is set to open this spring. "That is a state-of-the-art neuroscience facility that will combine research, teaching and patient care," she said. Demolition of existing properties continues on the southeast corner of MLK Boulevard and Reading Road. Last fall, UC announced it will build its new Digital Futures Building on that corner development called Uptown Gateway. "That will also lead to a second building of about 150,000 square feet where there will be space to attract companies that want to partner with UC," Robinson said. "Right now we have about $600 million in projects underway. We're thinking it could be in the $1 billion range and beyond." 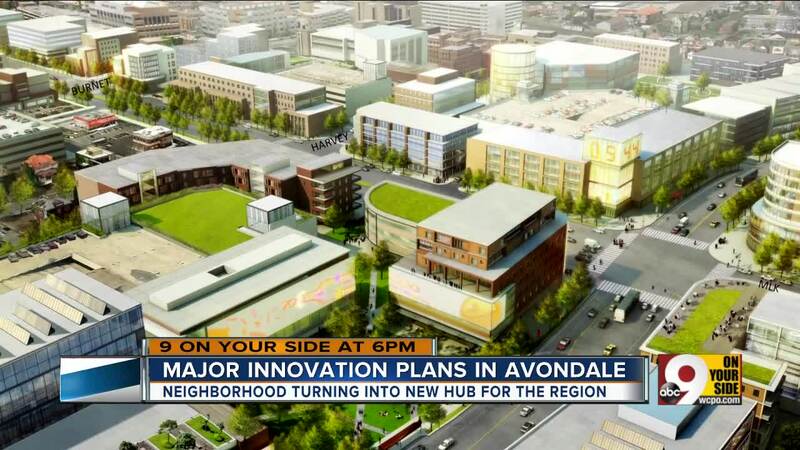 The developments will create a large change for the Avondale neighborhood. Patricia Milton, Avondale Community Council president, said the council "has been working closely with the Uptown Consortium on the Innovation Corridor project since its inception." "Our goal is to make sure the (Innovation Corridor) is not isolated from the community or creating an area not community-friendly," Milton said. Robinson said they are "very mindful" of the needs of Avondale and are working to include residents in job and investment opportunities. "We need to make sure that, particularly in Avondale, that the existing residents have opportunities to stay, invest in their home, while attracting new residents," said Robinson. The Uptown Consortium expects the Innovation Corridor to attract and retain about 6,000 jobs. Throughout 2019, 9 On Your Side will bring you stories about transportation and growth as part of a series called "Move Up Cincinnati." You can comment or send us your story ideas to moveupcincinnati@wcpo.com.